A Proven Process to Help you "See Service"
We meet with the key members of your team and build an understanding of your business and the technology that runs it, using our proven process and expertise. Where you have gaps in knowledge of how multiple Configuration Items within your environment interact to form a complete Application Service, we apply our state-of-the-art discovery technology and techniques to gather the information we need to feed our service. Following the Technical Assessment we document the specification of exactly what we can deliver and what we will need from you to make that possible. We also include here the offer of a free of charge Proof of Concept for one service. Once you have agreed the specification and given us the go ahead, we send you pre-configured ServiceVisual Agent’s which will collect the data to populate our dashboards. This agent will discover and begin to measure the configuration items that make up your services. Our team of experts will then configure and model these elements into the unique Application Services that drive your business including dependencies, redundancy and cluster configurations. The dashboards will be available via NOC screens, desktop and mobile devices. ServiceVisual is a Managed Service offering, meaning that maintenance of the system is all down to us. This means our customer can get with managing IT and spend less time managing tools! We are passionate that our service grows with your business, in order to ensure this we need to stay in touch on a regular basis. For this reason you will assigned a Technical Account Manager. In addition our system constantly monitors your environment to notify our system of any topology changes, ensuring we keep our dashboards up to date. Your key services are discovered and modeled by our experts, using our unique technology and processes. 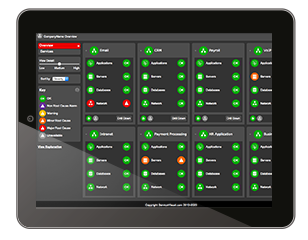 The results are then delivered as a Dashboard service, accessible within your NOC or via your mobile device. 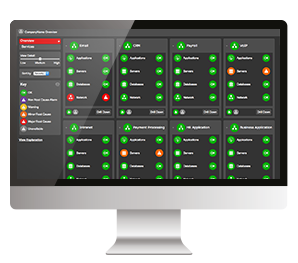 We provide our dashboards and associated monitoring as a service from a secure, resilient datacenter. ServiceVisual is not dependent on integration or replacement of your existing operational monitoring tools. ServiceVisual is quick to deploy. We can be up and running in a matter of days not weeks or months. We offer a free Proof of Concept around one of your Application Services.